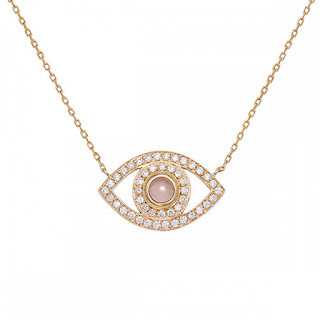 It's official the evil eye has replaced the skull as the edgy motif to adorn yourself with. 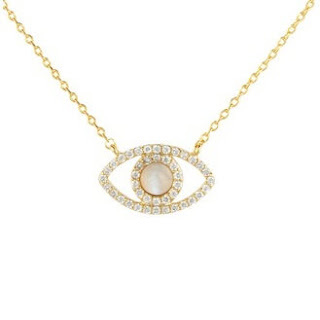 I have been coveting this diamond eye necklace from Netali Nissim for many years and one day whilst browsing one of my go to high street shops for jewellery I spotted this look a like piece for £2777 less than the fine jewellery version. This necklace has a modern amulet look to it and I love the use of pave set stones that we have seen in so many jewellery designs in the last few years. As these two necklaces have a price difference of about £2777 we are talking serious savings and splurgings but what does the £2777 price difference get you? The fine necklace from Netali Nissim is made with 0.71 ct white diamonds and a quartz centre pupil whilst the Accessorize one is made with all cubic zircon and is from the Z for Accessorize collection. The accessorize evil eye necklace has a gold plated chain whilst the Netali Nissim chain is 18K gold. 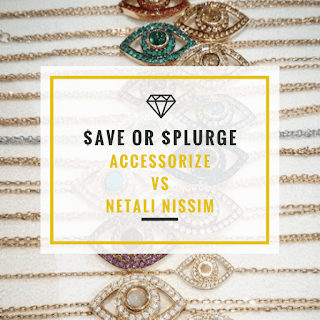 Do you save and get the look from Accessorize or splurge and go for the show stopper from Netali Nissim?